The candidates are advised to peruse the Prospectus-2019/Admission Policy, available on University website thoroughly and check eligibility/other details before submitting their Application Forms. The candidate must have passed Mathematics as one of the subjects and having secured at least 40% marks at graduation level from the University of Kashmir or from any other recognized University. The candidate must have passed bachelor’s degree under (10+2+3) pattern with Economics as one of the subjects or BA LLB (Integrated) or BBA/B.Com/B.Sc (math or statistics) (or) B.Sc. Agriculture ICS/CA/ICWA having secured at least 40% marks at graduation level from University of Kashmir or from any other recognized University / Institute. B.Com under (10+2+3) pattern BBA/BBM/BBS or B.A/B.Sc. with P.G Diploma in Accountancy/ Cost Accountancy with at least 40% marks. 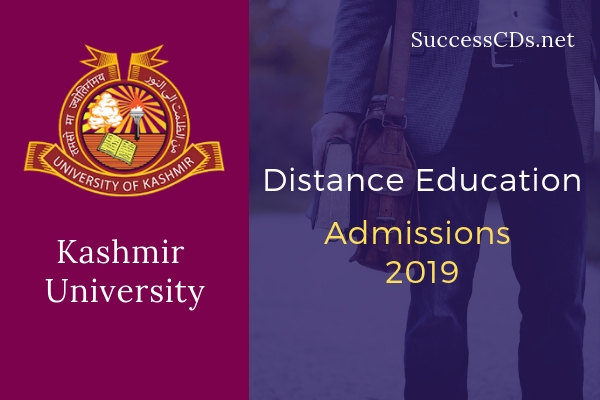 Step-1: Visit www.kashmiruniversity.net or www.kashmiruniversity.ac.in and click on Link Admissions 2019. Read Important Instructions for Registration and Submission of Form carefully before proceeding further. Step-3: Select the desired Programs and District Preference and Upload your latest passport size photograph. Step-5: Deposit the non-refundable “Application Fee of Rs. 150/- (including Rs. 50/- as IT Fee) and Processing fee of Rs. 250/- “i.e. Rs. 400/-for one course and Rs. 250/- for each subsequent course through Online mode only. The candidates must check the fee status of their Application Forms after three days from the submission of online Application Form In case, fee reconciliation is pending, the candidate should contact the office of the Directorate of Admissions & Competitive Examinations, University of Kashmir. Number of seats for above programs at various campuses, other details related to Admissions are reflected in Admission Policy/University Prospectus 2019 and relevant statutes, available on the University Website.